What Is Firmware And Why Does My Player Need Updates? The most basic definition of Firmware is the programming inside the main chip that makes the player run. Firmware updates can be used to add functions, fix bugs, and add playback compatibility for disc playback. Why do we need to update firmware for disc compatibility? One of the main reasons include copy protection. The Blu-ray format utilizes a variety of copy protection methods such as DRM (Digital Rights Management) and AACS (Advanced Access Content System) to prevent Blu-ray Disc movies from being pirated. Each movie is encrypted with a unique title key, and several copies of the title key, encrypted with different processing keys, are stored on the disc. When you play a disc the Blu-ray player figures out which of the encrypted title keys it has the ability to decrypt. Then it uses its device keys to compute the necessary processing key, uses the processing key to decrypt the title key, and then uses the title key to extract the content (movie) and finally begins playing the movie. Many new movies also utilize Java scripting which can cause compatibility problems. Unlike DVDs that just contain a Movie and a Title, Blu-ray discs have many added features with advanced coding that some players may not be able to read. 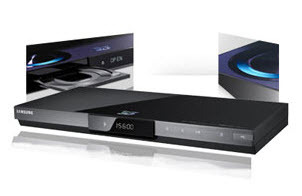 If new discs have an unrecognizable code the disc will fail to read, and the Blu-ray Player will need a firmware update. Since the Blu-ray format has not been standardized, AACS keys and their decryption methods change from one movie producer to another. This keeps hackers from ‘cracking’ the encryption keys and making copies of the movie and selling /or uploading it online. If the player doesn’t recognize or can’t process any of the AACS keys, the disc may not play properly or at all. Samsung.com/support lists current firmware available for your player and provides steps for updating your firmware either by USB or CD. You must enter your model number or select model by category to view your player's specific firmware.